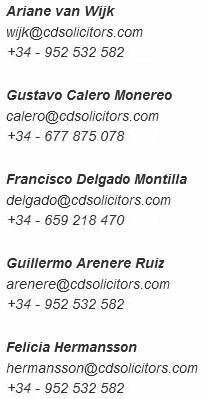 The area of Spanish Family Law includes a broad range of legal matters, such as pre-nuptial agreements, adoptions, guardianships, separations, divorces and issues related to matrimonial property rights and enforcement of maintenance. All matters involving children are included in this area of practice. Matters relating to Family Law are often fraught with difficult and emotional decisions. At C&D Solicitors we are aware of this and thus attempt to reduce the emotional tension of negotiation while achieving the most beneficial results for our clients. Divorce Law in Spain is a separate area of Family Law. Actions commenced for a divorce and for division of matrimonial property are two separate legal actions. The issues of maintenance and custody of children are dealt with in a divorce action, while allocation of both real and personal property between spouses is addressed in a matrimonial property action. Divorce includes a broad range of matters and is inevitably a complex and emotional process. The solicitors at C&D Solicitors can help clients to sort through the many concerns which affect them, and ensure that all relevant issues are addressed in necessary documents and discussions with opposing counsel. C&D Solicitors offers a full range of services which relate to Divorce Law and Family Law. The firm’s emphasis on consultation allows the development of a course of action which is best suited to the needs and desires of each individual client.